The Konica Minolta PagePro 1350W is a consumer-grade black and white laser printer designed to print quickly for its small form factor. However, it lacks many features to ensure its future compatibility and is difficult to recommend for anything but personal or perhaps small-scale home network use at this point in time. The printer measures 15" by 10" 9" with all of its input and output trays folded and 15" by 15" by 13" with all trays extended. Even for small laser printers this is extremely compact, making the 1350W worth considering if you are struggling to find desk space for a printer in a cramped environment. Furthermore, the printer weighs only 17 lbs, making it almost impossible for it to weigh down a workspace or to prove cumbersome and immobile. 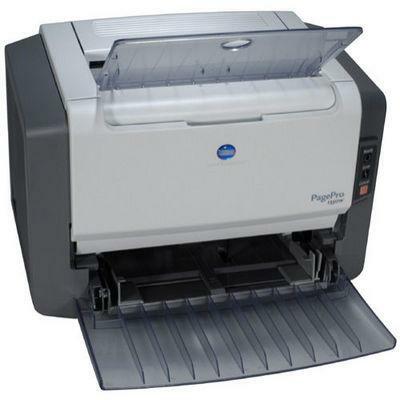 The 1350W produces pages at 21 pages per minute, respectable for a consumer laser printer like this one. Automatic duplexing is not available, but software that automates the paper flipping process is included with the printer's drivers. It supports printing to A4, A5, and Folio-sized sheets of paper, but also to recycled paper, thick stock, transparencies, and laser-quality labels. The printer handles documents at resolutions of 600 by 600 dpi, 1200 by 600 dpi, or 1200 by 1200 dpi, more than satisfactory for text and most grayscale graphic applications. The 1350W has 8 MB of RAM. Konica Minolta's documentation does not indicate whether this is expandable, but it likely is not. The 1350W includes no official support for non-Windows systems, though third-party workarounds to make the printer compatible with some versions of Mac OS X are available. The printer includes drivers to support Windows 98SE, Windows 2000, Me, and XP, but is not currently listed as being compatible with Windows 7. The 1350W includes only an IEEE-1284 Parallel port and a USB 1.1 port. To network the printer you will need to either share it via printer sharing, requiring that the computer connected to the printer be on whenever other users need to print, or purchase and connect a compatible third-party print server. Furthermore, the fact that the printer's port is only USB 1.1, rather than USB 2.0, may slow down applications considerably depending on the volume and throughput being sent to the printer. The printer has a maximum input capacity of 150 sheets that cannot be expanded. This all but disqualifies the printer from office use, as it stores well under half a ream of paper at a time and would require constant maintenance to ensure access to paper. Furthermore, clearing paper jams requires removal of the toner cartridge, making the printer even more inefficient for anything but small-scale personal use, the one application in which it may be cost-effective. Some users complain that the printer's output tray does not handle its 100-sheet rated capacity particularly well, leading to sheets being scattered and thrown off of the tray as they print, requiring tedious re-sorting after printing large documents. Some users report that the printer, when not given new Konica Minolta brand toner, will enter a Deep Cleaning mode and refuse to print any documents at speeds above 6 pages per minute, making third-party toner or toner refills highly undesirable. This puts the user at a considerable disadvantage, as they are at the mercy of Konica Minolta's pricing system and willingness to continue manufacturing this printer's official toner cartridges in order to ensure that they will still be able to print documents at the speed advertised. 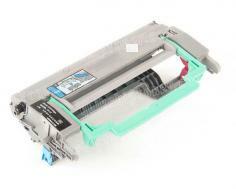 Review it: "Konica Minolta PagePro 1350W "
The PagePro 1350W has separate drum and toner units. 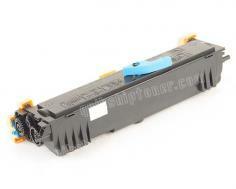 The PagePro 1350W's toner cartridges are rated at yields of 6000 pages at 5% coverage and the drum units are rated at 20000 pages at 5% coverage, meaning that the drum units will need to be replaced at approximately every three and one-third cartridges. The separation of toner and drum unit into separate cartridges brings down long-term maintenance costs but does mean that more maintenance will be done in order to ensure that the printer continues to operate at maximum speed. Furthermore, see Cons above for information about the fact that the 1350W performs markedly differently when not given Konica Minolta-brand toner.